Hi. I have been growing tricyrtis for about 5 years. I have about 6 different kinds. I recently received some Latiofolia that aren't doing so well. They are planted in the same garden as my other toads. Within a relatively short period of time after receipt of my plants they are dying. They "mush" on the leaves and ultimately the whole plant lays down and mushes up. There is still a root system but no life in the plant. I treated for grubs and other like insects thinking this may be the problem since I did see some over the past month. They are gone and my Latiofolia are still dying one by one. They are in well drained soil and well shaded. Many nurseries have trouble producing a quality Tricyrtis plant. By late summer, plants are typically half-brown and barely saleable until they bloom. With the T. formosana blood in Ã¢â‚¬ËœTojenÃ¢â‚¬â„¢, Ã¢â‚¬ËœEmpressÃ¢â‚¬â„¢, Ã¢â‚¬ËœGilty PleasureÃ¢â‚¬â„¢, and Ã¢â‚¬ËœGilt EdgeÃ¢â‚¬â„¢, you canÃ¢â‚¬â„¢t lose, as the plants grow strong and clean from the soil-line to the flowering tips. Is there any way you can contact the place you bought them from and find out if there might be a problem with their plants? Thank you. I have Tojen now but none of the others you listed. I have Lasiocarpa, hotogisu, white towers, Flava, matsukasi, samuri and latiofolia. I sure can't spell the names but I love the plants. I will write down the other plants you listed and look into them. I did contact the seller and he sent a replacement on one of them. Then another one died and I haven't heard back yet. Might have to write it off as a loss and chalk it up to experience. Looks like I am about to loose the last one. UGH! Glad the list was helpful. You mention that you contacted the seller. I'm wondering if you ordered these over the internet or even mailorder. If so, you might want to look at this site before you order again. I hope you get replacements! Yes, I did order theses mailorder. I think the stress was just too much for them. I have ordered in the past, white towers, and they were just fine. I checked the watchdog group and this nursery is rated 100 percent. I am hoping to hear back. It has been over 1 week but then again folks get busy. I went to the link you provided and am going to be making a trip to Wisconsin in June. I will go to one of those nurseries and buy them myself. Don't think I will be doing anymore mailorder. It is ok for bulbs but live plants seem to suffer quite a bit. I think it depends on who you're ordering from and what time of year. I just placed a large order with Roslyn Nursery in Long Island, NY and had the plants shipped to my daughter in Delaware. They were in fantastic shape when they arrived. Great folks there. Wisconsin, very pretty place!!! Have a great trip. Oh, are you in zone 7? I live in Texas. To tell you the truth, I have seen that I am in 7 on some sites and 8 in others. I am beginning to think I don't know where I am!! Hee Hee. Maybe that should be my next post. 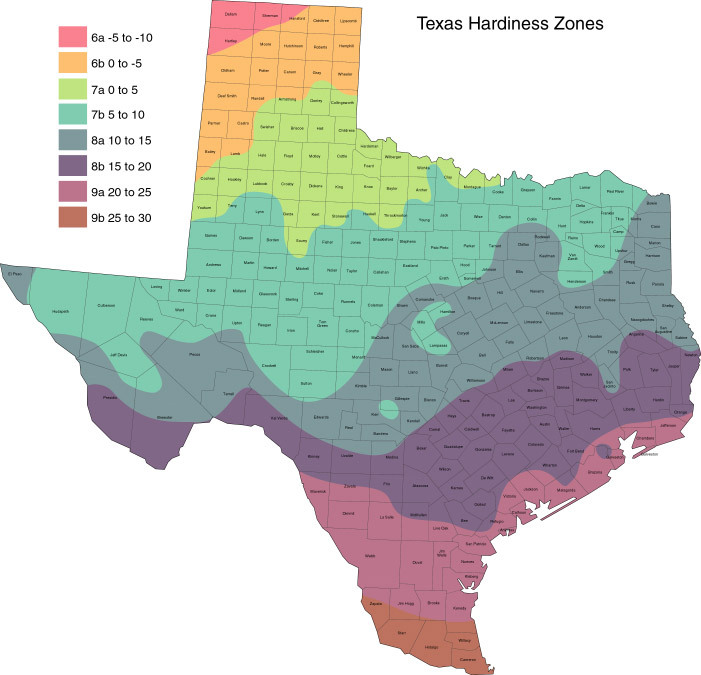 What zone is Texas really in. I certainly have had my share of good experiences with mailorder but this last year hasn't been that good I guess. I take note of good feedback but it is always a risk I guess. I wrote down the name of the nursery in New York. This time I will take advantage of this trip and go myself to the one in Wisconsin. It will give me more confidence. I love toads and have built an area just for them. I'll bet you're on the border of zones 7 and 8. Here's a couple of Perdue maps of the state. Maybe that will show where you are. It must be awful to not know where you are!! Happens to me sometimes. I'm sure you'll like the folks at Roslyn Nursery. They were even kind enough to give me advice on a plant I didn't even order from them! Have a safe trip and have fun! Oh, and don't adopt too many plants. I will check that out. Thank you. I should have mentioned that this plant is the same size, 4 inches tall, since I bought it 3 months ago. It is not growing either. I treated it for the fungus. I also removed it from the bed. I pulled off all the dead leaves and the ones left are still nice green. It is flimsy but standing up. Seems funny to me that it wouldn't grow either. The replacement plant if 13 inches tall and blooming now. Go figure! You might want to remember that toady lilies are pretty slow growing - if you knock the fungus in the head, you still may have to wait a couple of seasons for a decent show. Also, just as a note, I wouldn't put too much trust in ratings on The Garden Watchdog. It seems that they are facing a great deal of criticism on their website because of vendor flaming. While I might agree that the Web will never replace the garden center, there are good deals to be had from reputable companies. There are also crooks and charlatans who will take your money and run. They can be found both online AND in bricks and mortar nurseries too. This site was designed to be a source of balanced impartial information and we are happy to help you with gardening questions of almost any type. That said we have never jumped into the business of yeaing or naying other companies because 1) Singular experiences do not make for a sound base of opinion and 2) because we cannot verify anyone elses opinion other than our own. Sure, we occasionally tout a product we actually use, but that's because we actually use it!